When I think of historical makeup, the usual image to spring to mind is a florid Rococo beauty smothered in powder and false hair. 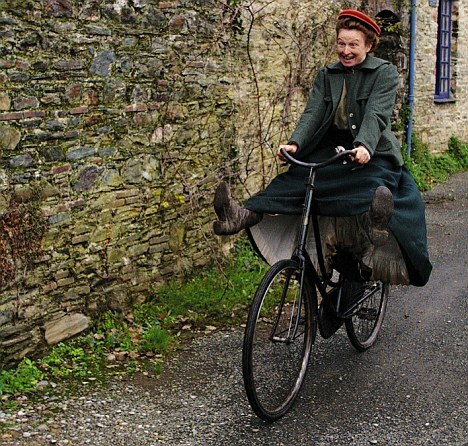 Victorian heroines had better things to do, like passing out on the moors and rejecting marriage proposals from clergymen. Victorian women did wear makeup. It wasn’t proper to talk about wearing makeup, and it certainly wasn’t proper to look like you wore makeup. That was for actresses and other ladies of questionable virtue. Beauty, wrote nineteenth century agony aunts, came from clean living and inner purity. That’s rubbish, obviously. So women turned to cosmetics. As well as unwholesome, makeup was considered rather old-fashioned, carrying connotations of old maids cack-handedly tarting themselves up. The desirable look was that of the fictional milkmaid, who rose merrily at dawn with bright eyes, spent the day out in the fresh air (remaining untanned, importantly), and never read unsavoury novels. Her cheerful disposition gave her eyes sparkle and her cheeks a natural bloom. To achieve the milkbabe look, talcum powder, cold cream, and fragrances were normal and acceptable on any lady’s dressing table. 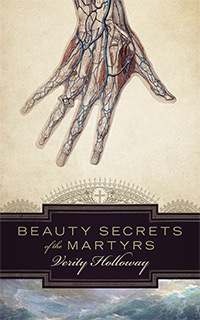 They might be joined by eyebrow darkeners of coal or crushed cloves… and the dreaded rouge, so easy to apply too thickly. 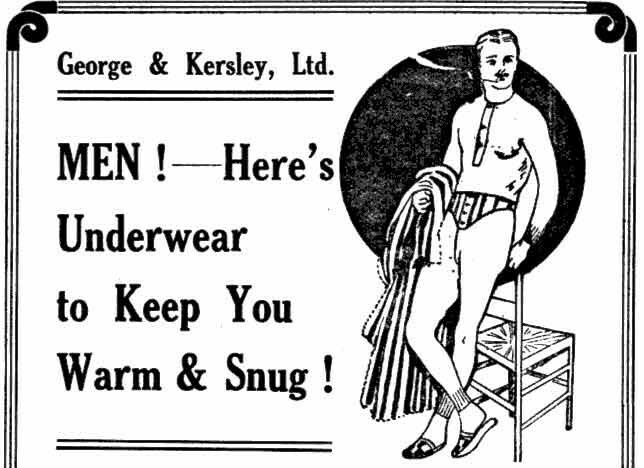 Men, too, had their cosmetics. Mascara, or moustache wax, was applied with a fingertip to give definition to moustaches and eyebrows. 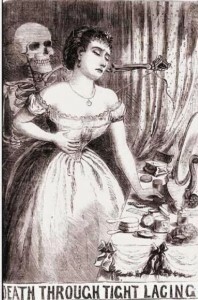 Many Victorian women fell for the popular myth that regularly trimming one’s eyelashes would make them grow longer and fuller. It’s easy to see how such disasters would lead a woman to borrow from her husband’s mascara stash. 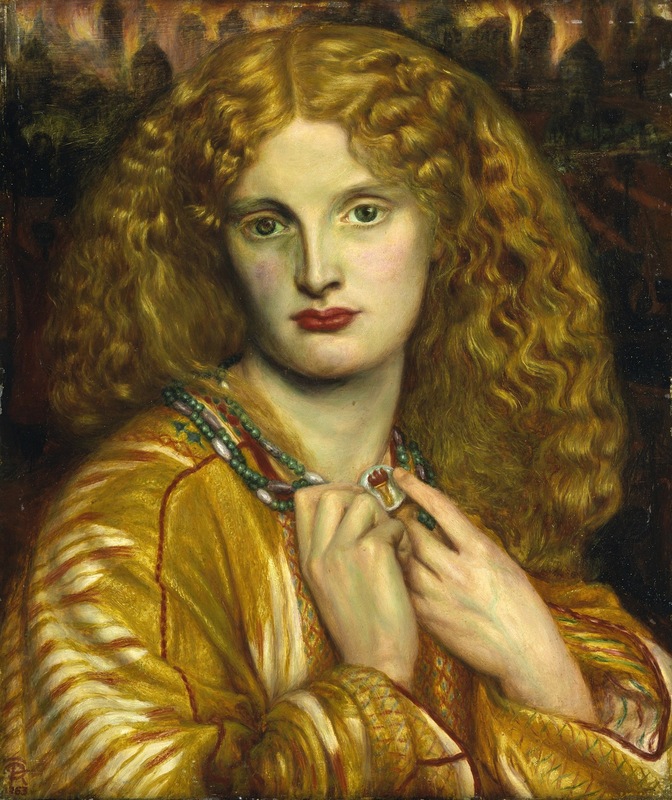 Dante Gabriel Rossetti’s Helen of Troy. 1863. The vivid red lips typical of his later work give his models a savage, vampiric look, setting them apart from the dainty, delicately blushing ideal ladies of the day. They know they’re gorgeous, and they’ll probably bury you. Bear in mind, two dots of pink on a face as pale as that was a telltale sign of tuberculosis, too. 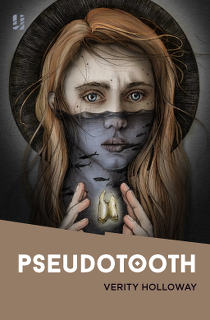 There’s a whole mountain of Victorian psycho-sexual neurosis when it comes to women’s faces and what they chose to put on them, which is partly why I was so excited when, trawling Etsy, I came across LBCC Historical Apothecary. 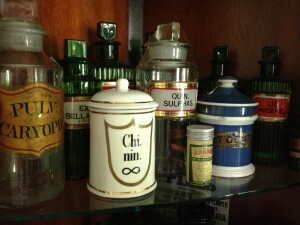 There you’ll find authentic reproductions of cosmetics from all kinds of historical eras, from jazz age scented face powder to jasmine hair oil from 1772. LBBC have plenty of rouges to choose from. I went for the Turkish variety. It’s a reproduction of an 1810 recipe that was used since at least 1740 and later on, too. It takes five months to make from repurposed violin shavings, and was said to be “beautiful and inoffensive”. In the bottle, it’s almost indistinguishable from blood, and smells like tasty floral vinegar. So here I am, pretending to be a Victorian pretending to be makeup-free. 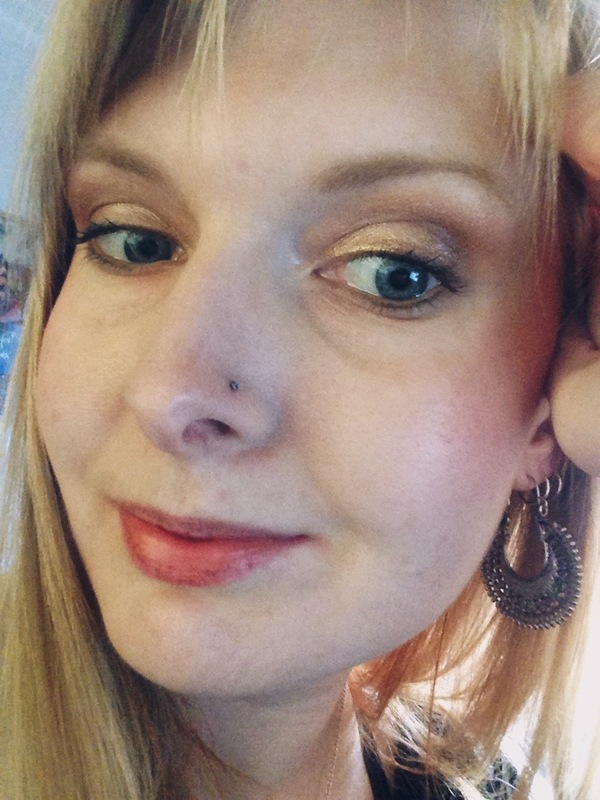 On the lips, the rouge is a tad drying, but the colour lasts all day and sits happily under a layer of Vaseline. It doesn’t bleed. The only other lip tints I’ve tried are from Bourjois and Benefit, and both of them stain a heavy colour at first and fade quickly. This rouge acted differently from the start – I definitely prefer it to modern tints. 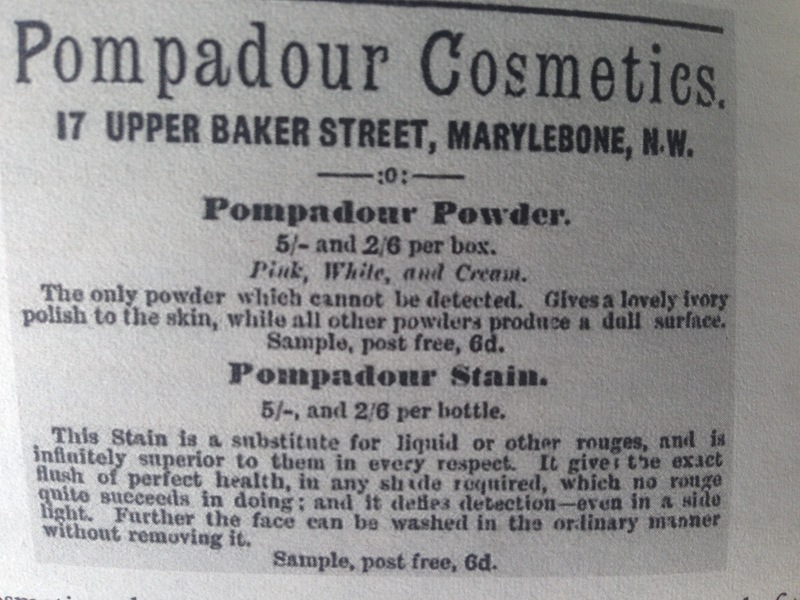 It’s easy to imagine a Victorian woman using this clandestinely while her mother-in-law bleated on about ‘paint’. On the cheeks, I stippled on a tiny amount with a soft sponge and blended it quickly before it had a chance to stain. 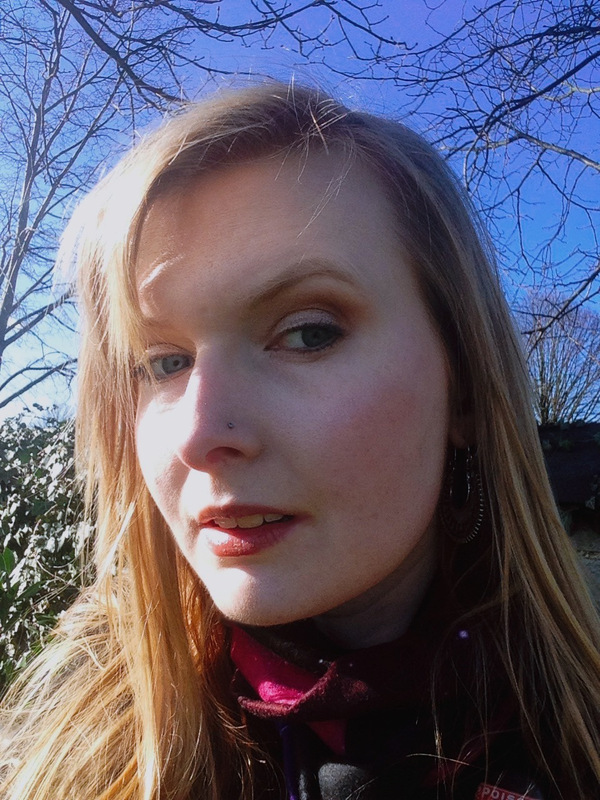 Despite having no prior experience with any blusher whatsoever (pasty goth for life) I managed not to make any disasters, but I would say go easy. You can always add more. That really dark bit’s a shadow. But now I want to try a more lurid eighteenth century look at a later date. 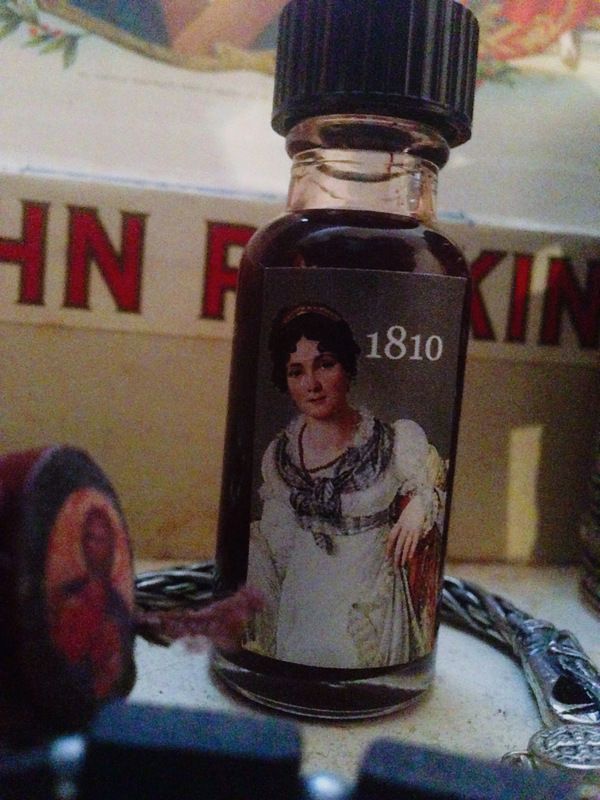 And definitely the 1772 rose tinted lip balm for when I’m out and about, beheading nobles, etc. Two days until Halloween! Which means there’s still time to acquire some 100% natural dark circles around your eyes. Maybe she’s born with it; maybe she’s too scared to sleep. 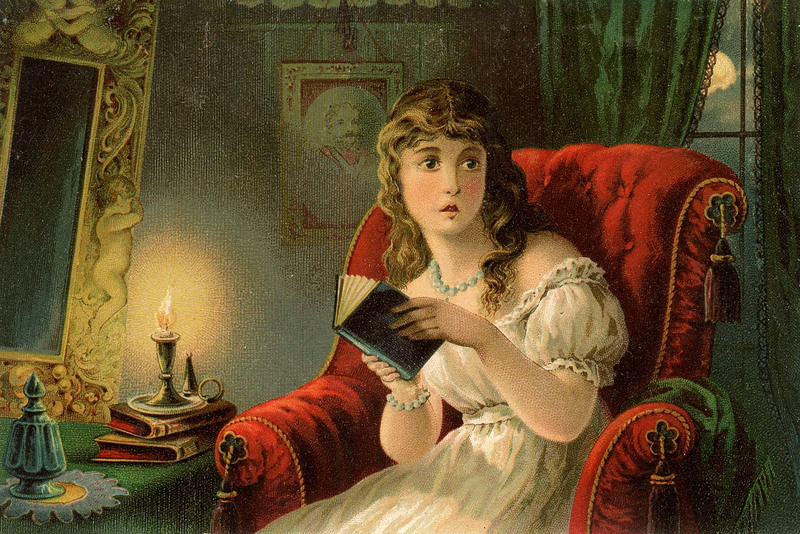 I’ve been meaning to do a book recommendation post for a while, so here are some scary stories to give your cheeks that desirable rosy glow. White roses. Dead ones. 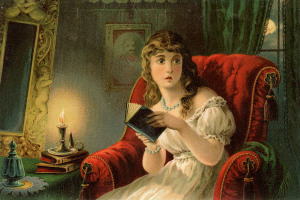 Susan Hill is one of our finest living ghost story writers, and Dolly is the tale of what happens when children go bad. Brief enough to be read in one sitting, Dolly takes the old spooky doll trope and shakes it by the shoulders. I love Peter Ackroyd. I love hulking London churches. And I love a nice occult murder conspiracy. Ackroyd has a way of presenting jump-scare moments so coolly, the reader is totally taken by surprise. He’s still one of the few horror-esque authors who can genuinely thrill me. Photographs of abandoned Arctic whaling stations are terrifying, let alone having to live in one, alone, when you know the sun isn’t coming up for months. Part paranormal horror, part solitude survival story, Dark Matter is a genuinely refreshing, tense book with a vivid sense of place. We were all lonely children, right? And we all wished for a friend. George Davies lived to wish he never had. The Quick is for vampire lovers. ‘Enter the rooms of London’s mysterious Aegolius Club – a society of the richest, most powerful men in England’. I want more from The Quick’s universe – it feels a natural springboard for short stories and sequels. “No live organism can continue to exist sanely under conditions of absolute reality”. Shirley Jackson is the master of the haunted house story. It’s a classic. Go and read it. Have a pleasurably traumatic happy Halloween, friends! And recommend me some books in the comments. I used to be able to dream lucidly. It took practise. I had a notebook covered in Chinese silk that I kept beside my bed. Whenever I woke from a dream, I’d turn on the light and immediately write every detail down. After several weeks of this, I was an active player in my subconscious world. I could choose where to walk, what to look at, when to fight and when to run away. I wouldn’t call it fun – to be inside and outside one’s body simultaneously – but it made me aware that the world of dreams is as real and as valid as the waking one. You can find answers there that you can’t in daylight. That’s the premise of Horsehead, a 2014 horror film directed by Romaine Basset. Jessica, a young woman studying the psychology of dreams, travels to her mother’s home in France for the funeral of the grandmother she never really knew. Relations with her mother aren’t any better, and when Jessica goes down the with flu, dreams are her only escape from their bickering. The fever, coupled with the bottle of ether she keeps sniffing, makes for some horrifying dreams, and she is quickly confronted by a horse-headed priest-beast called The Cardinal. When it emerges that her grandmother committed suicide, Jessica must follow her spirit deep into the subconscious mind to discover the secret The Cardinal is guarding with his scythe. Firstly, this film pushes all my aesthetic buttons. 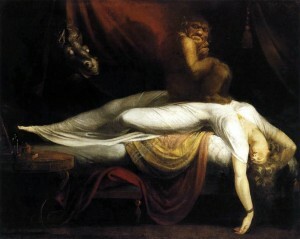 Everyone will recognise the Fuseli Nightmare painting above, and most scenes are shot in that kind of amniotic red darkness suggestive of opiates and deviance. It’s all very consciously Angela Carter-esque, with shades of The Company of Wolves in the costumes and the inventive gore. (Mild spoiler: it’s not a gory film, per say, but if pregnancy-related violence is too much for you, you might want to give Horsehead a miss.) Jessica’s mother lives in the kind of pretty, cobbled French village no normal human being could ever afford a house in, but by night it descends into medieval darkness. The quaint, winding streets take on a haunted quality as Jessica roams them in her penitent robes and Riding Hood cape. There’s a constant sense of unreality which might annoy some viewers. Everyone speaks in an overly-deliberate way, even when Jessica is awake. George, the baritone caretaker, verges on something from The Dark Crystal, though the echoing industrial soundtrack (free of jump scares) keeps the film from becoming ridiculous. I liked that about Horsehead. If you’re going to have a literal horse-headed monster lumbering about, unreality is something you need to embrace with enthusiasm. Though the family do keep the dead grandmother upstairs for an awfully long time. 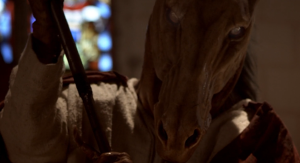 If you enjoy visually-striking, thought-provoking horror or fantasy, you’ll likely love Horsehead. If you prefer quests and defeatable demons, however, there’s likely more reading between lines than you’ll have patience for. Horsehead belongs thoroughly in the realms of the subconscious. 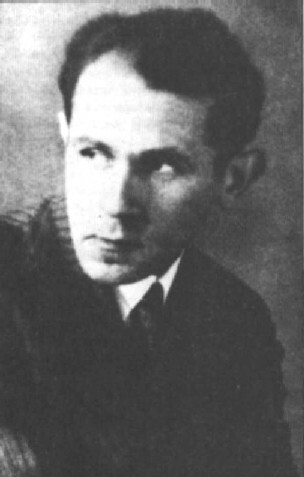 Drako Oho Zarhazar had seven lives. Having survived two nervous breakdowns, two suicide attempts, and two comas, he was left with a brain so damaged it could no longer record new memories. The words were tattooed on his body, along with tribal mandalas and what appears to an enormous celestial ram doing the splits. 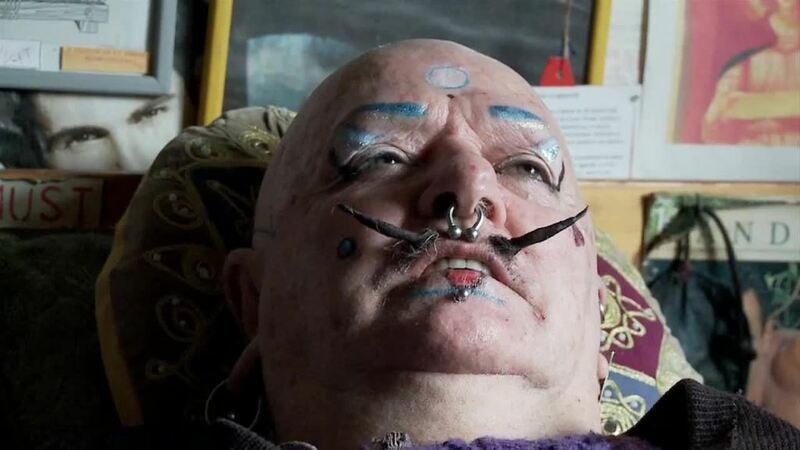 Born in 1936, Drako lived his last years in a council flat in Brighton where he was a familiar character, sweeping around town in a cape, telling ladies at the bus stop how he was once Salvador Dali’s angel and supplied The Rolling Stones with weed. The aristocratic RP and circus strongman panache might lead you to assume this was a deluded poseur – it’s Brighton, after all – but in Drako’s case, it’s all true. Toby Amies’ The Man Whose Mind Exploded peeks in on the life of this magnificently peculiar man, his wild past, and surreal, sad twilight years. Drako lived alone, experiencing each day afresh. “Do you remember me?” the filmmaker repeatedly asks. “Not especially, no.” But he was, as he put it, happy to be used. Drako was nothing if not an exhibitionist. Which perhaps you can tell at a glance. Amies spent four years getting to know Drako, in the disjointed, repetitive way brain damage requires. The distance a filmmaker is meant to keep from his subject is breached from the start, giving the film an intimate edge which makes for high emotional impact. 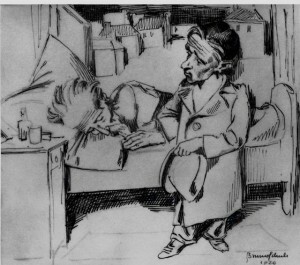 Amies was practically Drako’s carer, urging him – and sometimes pleading him – to take more care while candles burned amongst his toppling stacks of art and scribblings. It was an inferno waiting to happen, but Drako liked it that way. This is no pity party, nor would Drako want it to be. He laughed often, spicing up his musings on art and faith with seemingly random instances of surreal filth, simply because he liked it. It’s kind of endearing, once you get used to all the phalluses hanging from his ceiling. Low budget, tender-hearted, and hilarious, The Man Whose Mind Exploded will appeal to fans of Grey Gardens and Marwencol. It’s available to download from iTunes. It’s been a good couple of months for writing. 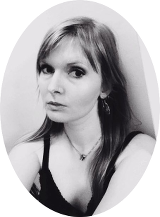 After getting some lovely responses over my last short story (it’s been nominated for the Pushcart Prize – I got the news in the middle of the night during a bout of chronic pain, and I initially thought it was my medication playing tricks) I’ve been putting concerted effort into finishing the novella that’s been lingering about since last winter. To be annoyingly vague, it concerns the nocturnal lives of mannequins, so, for a bit of research and a break from my desk, I visited Silent Partners at Cambridge’s Fitzwilliam Museum. The exhibition is far bigger than I anticipated. Three large rooms of artists’ lay figures, anatomists’ models, and fashion clotheshorses charting the evolution of the human simulacrum from religious devotion to arch Surrealism, along with striking photography and disembodied limbs dotted around the rest of the Fitz. 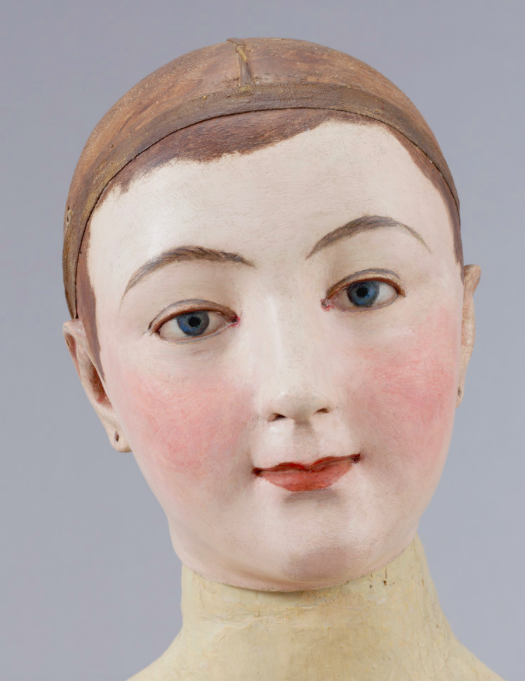 Life-sized dolls, no matter how beautifully made, are creepy, and the curators understand. From the moment you enter Silent Partners, you’re hit by the ‘uncanny valley’ effect. 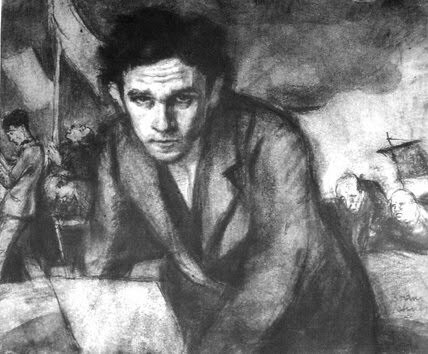 Viewing Walter Sickert’s life-sized wooden lay figure – laid out in a coffin, no less – I realised I was experiencing the same sensation of voyeurism I get when viewing Egyptian mummies or one of Doctor Gunther’s anonymous corpses. CT scans add to that sense of the uncanny. The mannequins once had life and purpose. Now they lie still. To my perverse delight, the Fitz has sourced one of Thomas Edison’s horrendous talking dolls. It’s about as adorable as a vocal manifestation in a poltergeist haunting. The business went bust in the 1890s because children were understandably terrified. Dolls – blonde and smiling or otherwise – have the power to scare, whether you want them to or not. Are you still with me after that? Less unnerving is the lay figure’s role as studio companion. Many of the nineteenth century mannequins on display have small, faintly smiling faces and eyes that look submissively up from under the lashes as if to say, “…master?” This of course led to accusations of fetishism – a new term in fin-de-siecle psychology. After all, an artist’s lay figure is an idealised, usually female figure, posable, silent, and always there. A kind of sexless mistress, lifelike but lifeless. 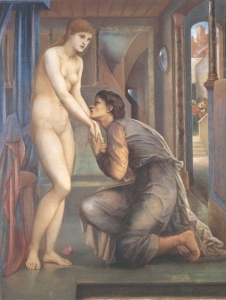 Edward Burne-Jones bears the brunt of this. 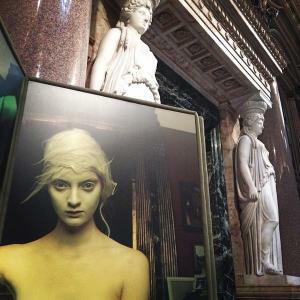 Comparing his Pygmalion series to the vibrant new woman of Jones’ time, one label points to Ned’s fixation with statue-serene models as a symptom of his own sexual repression. That strikes me as a bit harsh, particularly when looking at his famously fiery lover, Maria Zambaco. You don’t roll around on the cobblestones with someone if you’re not at least slightly open to the urgency of your own passions. 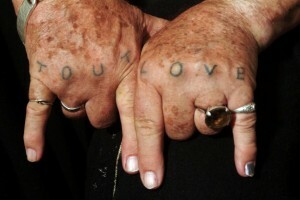 But I see what they’re getting at: ‘I love you, but please stand still and shut up’. 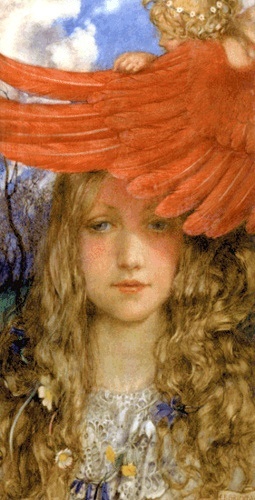 There’s a surprising amount of Pre-Raphaelite art, considering the movement was so concerned with realism. Ford Madox Brown owned five lay figures at the time of his death (including a horse), and The Last of England was completed partially with the help of these figures. Critics noticed. There’s a fun insult from the eighteenth century: “This painting stinks of the mannequin”. Millais was better at hiding his use of lay figures. The Black Brunswicker required two so that the models – Dickens’ daughter Katy and an army private not of her acquaintance – wouldn’t have to hold such an intimate pose. The fashion segment was particularly interesting. Earlier clothes modelling mannequins have far more physical agency than the ones you’ll see in Topshop windows. These eighteenth century lifeless girls have hands that reach and gesticulate, and faces poised as if to speak. It was only in the nineteenth century that shop windows began to display disembodied hips and busts. A decline in tailoring to the individual? Or a less sinister preference for cheap mass production? Overall, Silent Partners is an impressive undertaking and hugely interesting – and free! I’ll be returning at least once. The only downside was the lack of labels on the large photographs dotted around the other galleries, because I loved them but couldn’t find the photographer’s name. It’s probably my shortsightedness, but somebody enlighten me, please. Photo by StuffandStories on Twitter. 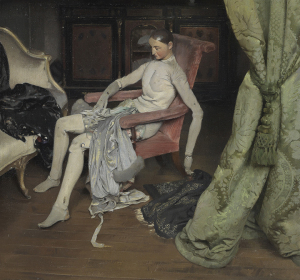 Silent Partners is on at the Fitzwilliam Museum of Cambridge until the 25th Jan 2015, and then the Musée Bourdelle in Paris from the 31st March until the 12th of July 2015. Doctor Dee’s Elizabethan scrying mirror! Not since 2012’s Pre-Raphaelites at The Tate have there been so many of my favourite things in a single room. Anyone who loves Gothic will lick their chops at The British Library. From the genre’s florid beginnings with The Castle of Otranto to The Sisters of Mercy crooning at girls who wander by mistake, the exhibition is a celebration of the pleasure Gothic’s many incarnations have brought people down the centuries – and how Gothic manages never to die. Crumbling ramparts, impenetrable forests, double lives, and lashings of gore. Gothic has always toyed with what disturbs us – the secret lives of respectable personages in Dr Jekyll and Mr Hyde, female sexuality in Carmilla, foreign invasion in Dracula. 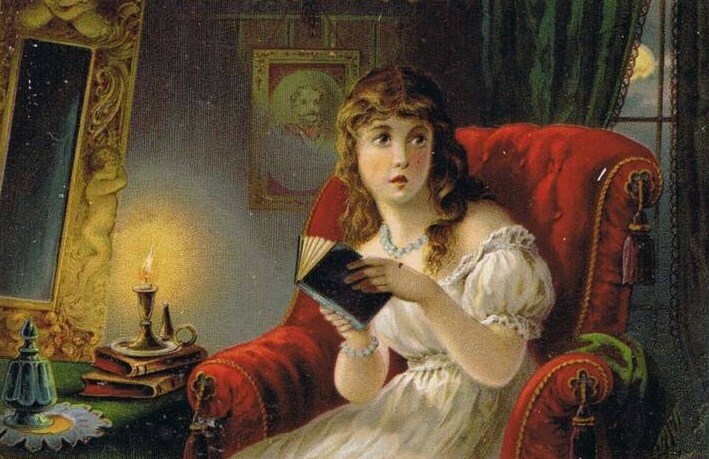 No wonder there was pearl-clutching at the thought of sensible Victorian girls devouring Gothic novels, letting their darkest desires run free. 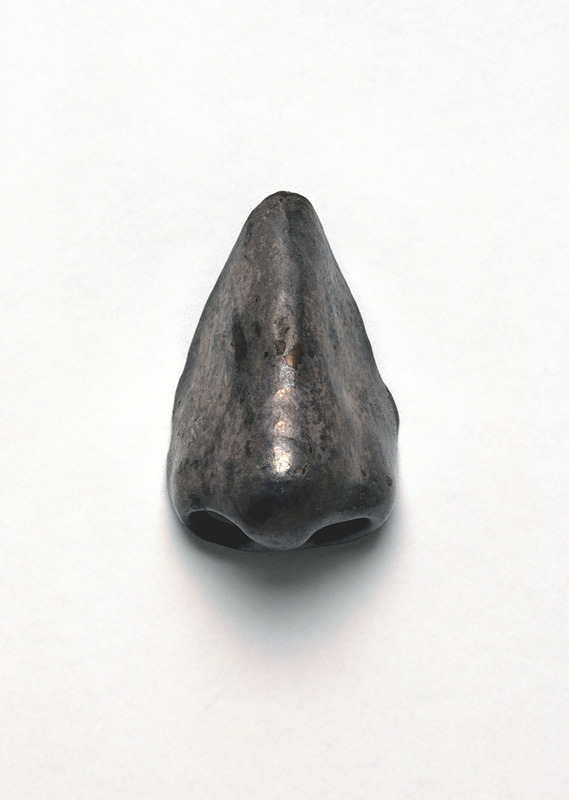 This breathless consumption of all things dreadful left early Gothic fans open to ridicule (try reading The Castle of Otranto without laughing), but the exhibition manages to convey Gothic’s steady evolution into a self-aware, perhaps even post-modern genre, taking us through to Edward Gorey’s playful macabre and the androgynous world of post-punk goth. The hysterical quality of Gothic is where the fun lies. Because there’s that veneer of ‘wink-wink, we know this is daft’, the genre has the opportunity to introduce genuinely scary ideas in a setting we’re already comfortable with. We sign up to the horror of Gothic while we may shy away from brutal realism. Take the alcoholism and child abuse in The Shining. We talk about the bathtub woman or the bloody lift, but what’s really chilling is Jack’s likability while he terrorises his wife and child with a croquet mallet. Gothic is something that lurks beneath the ordinary; a sense of heightened, oversaturated reality where the family secrets are literally locked in the attic, scratching with broken fingernails at all that floral Victorian wallpaper. 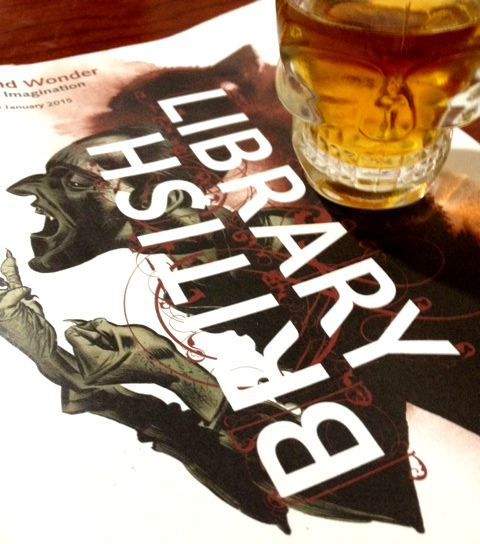 Terror & Wonder is on at the British Library until January 2015. 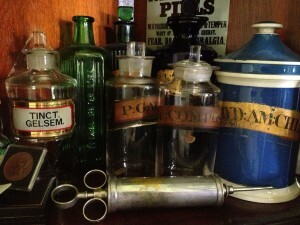 In a pub a few weeks ago, a doctor friend was telling me about his first autopsy. What stayed with him, he said, was how the surface brutality of the act was accompanied by a strange, palpable tenderness as the assembled students protected the face of the deceased, keeping it clean and untouched. I thought of this when reading Dr Richard Barnett’s new book, The Sick Rose, ‘a visual tour through disease in an age before colour photography’. These painstakingly detailed images, so much more intimate than a quick photo session for The Lancet, take on the task of showing human bodies at their most vulnerable while also communicating something of the subject’s soul. Even affirming it, in the face of what was – at least then – helpless suffering. 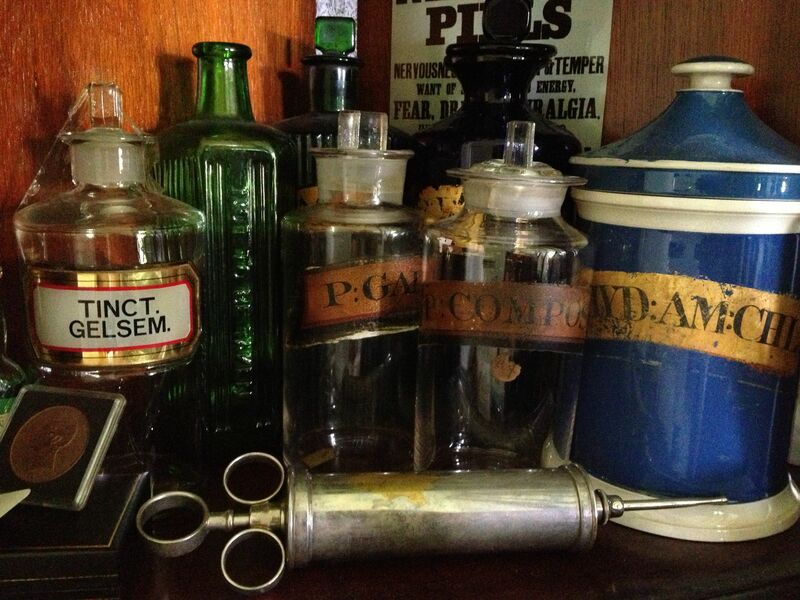 In case it comes as a shock, I love the history of medicine. Being a) a medical oddity myself, and b) from a family of doctors who refused to censor their conversation at the dinner table, I’m always up for a chat about the experimental origins of rhinoplasty or how best to suspend a foetus in lucite. I’ve been looking forward to this book for months, especially as I went on a London gin tour with Dr Barnett a couple of years ago, and if it weren’t for him, I wouldn’t have known about the 18th century gin-dispensing cat. That’s the kind of thing I need to know. And have I mentioned the contents of my living room? I was always going to love The Sick Rose. Physically, it’s gorgeous. A heavy, tactile hardback. Even the endpapers are smallpox, and the clinical, geometric cover design contrasts sharply with a portrait of a wasted young Veronese woman, blue with cholera. Thought has gone into the aesthetic, and it doesn’t go down any of the obvious ghoulish routes, making the reader uneasy from the off. Is this art or science? Is there a line dividing the two? That’s what I like about the book. It’s unflinching but compassionate. The images of sores, growths, pestilence, and dissection are shocking without being childish. 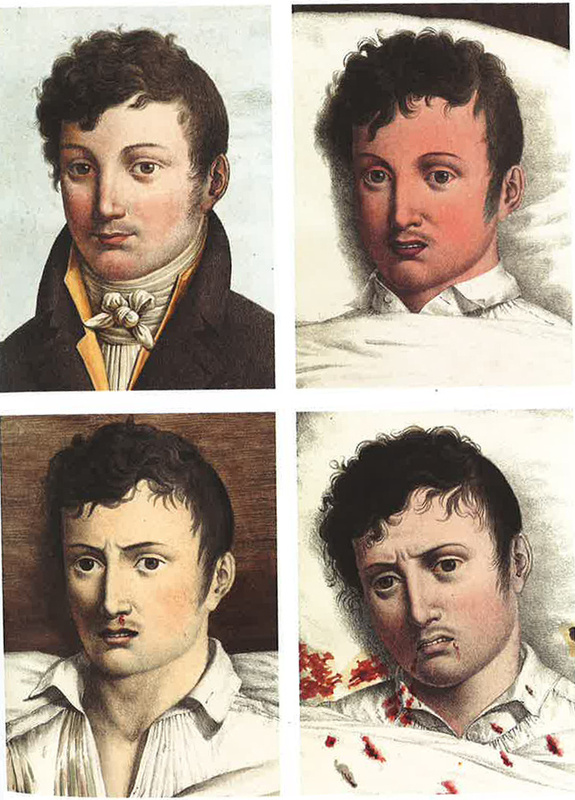 You’re invited to look into these faces and wonder who they belonged to. One particularly moving page features a baby wizened with syphilis, staring past the reader with ancient eyes. And then there’s the human ingenuity. Silver noses for patients disfigured by venereal disease, or beautiful art nouveau posters warning against ‘the white death’, a poetic and oddly desirable pseudonym for TB. 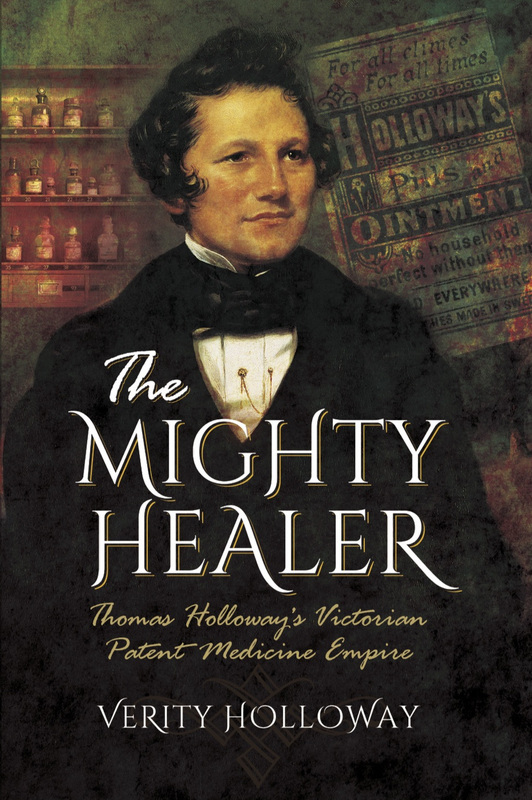 Even my Uncle Thomas Holloway makes an appearance, with his delicate ceramic pots of useless ointment, bearing the image of Britannia and her shield. Disease and death are inseparable from the human condition, so it’s natural we should turn to art for expression and protection. These symbolic gestures are not always comforting. For medieval physicians, leprosy was a sign of moral degradation, and the rituals that followed are disturbing. Barnett writes: “[Leprosy was] not only a disease but also a metaphor for the frail state of the human soul, portending the foulness of the grave and the agonies of purgatory. Some Catholic communities developed ceremonies in which lepers were declared symbolically dead, excluded from communal Christian life, even made to lie in a grave while a priest recited a burial mass”. Compassionate. One can’t help but look at the recent cultural resurgence of zombies and feel queasy. Can such things only appeal to us when we’re comfortably removed from the possibility of actual living death? And what does it say about us? Philosophical reflections aside, the most unsettling thing I learned while researching The Sick Rose was that the makers of the game series BioShock based the faces of the splicers (drug-crazed mindless killers, if you haven’t played) directly on those of disfigured WW1 servicemen. There’s an essay on it here by Suzannah Biernoff – upsetting reading, and something I’m astonished isn’t more widely known. BioShock is one of my favourite shoot-em-ups, but I’d never made the mental link until Biernoff pointed it out. These ‘points of contact and dissonance’ between art, entertainment, and anatomy too often tread the problematic line of appropriation. It needs examining, and The Sick Rose is refreshingly mindful of this. 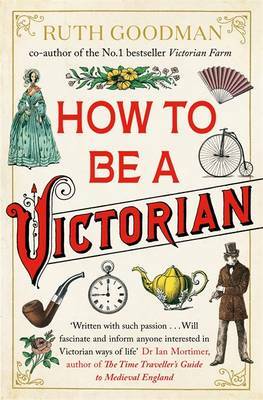 In short, I’m recommending the book to everyone. It’s beautiful and emotionally-engaging. 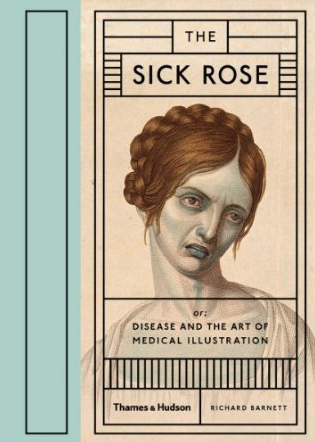 All the while the ravages of disease and cultural ideas of monstrosity go hand in hand, thoughtful books like The Sick Rose are still very much needed. It’s natural to be fascinated by the blood and horror of the past, but it’s important to temper that fascination with the humanity of the subject. We mustn’t forget how relatively fortunate we are today. Athelstan is a delicate woodland faun, and I won’t hear otherwise. I’m obsessed with History’s drama series, Vikings. 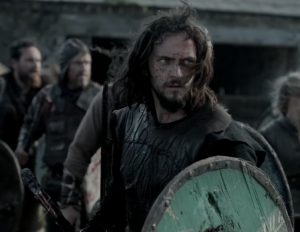 I only started watching because I enjoy a bit of the old ultraviolence, but now I’m emotionally involved to an embarrassing degree and spend my time praying for Athelstan’s safety. That poor child has been through enough. All the hacking and slashing has piqued my interest, but, as fans of the show have pointed out, Vikings is only tenuously based on real events. We visited The British Museum’s wildly popular new exhibit – Vikings: Life and Legend – to learn more. What’s this talk of going home? And the women of Trondheim won’t see me this autumn. I love the Irish lady as well as my young self. A man shouldn’t clutch at his cup, but moderately drink his mead. A thousand years on, and Europe still isn’t listening. However, if it’s indiscriminate bloodshed you’re after, there’s a lot to take in. We handled a 10th century axe-head, which the attendant helpfully informed us “was for killing people”. Then there was the absolute cutting-edge of weapon technology: Ulfberht swords. 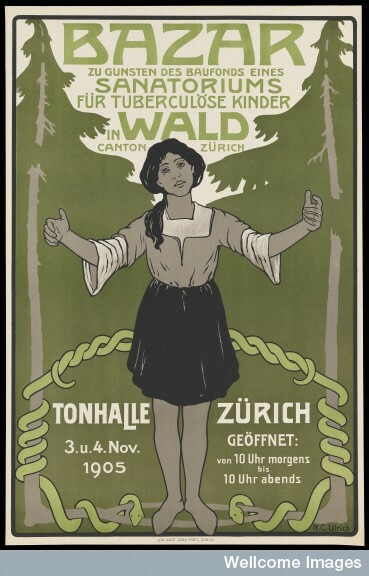 So powerfully made and sought-after were Ulfberhts, counterfeits were churned out like dubious Rolexes. There’s a documentary on Youtube about the staggering amount of effort put into making these swords, topped by a striking signature hammered into the blade – one slip and the sword was ruined. 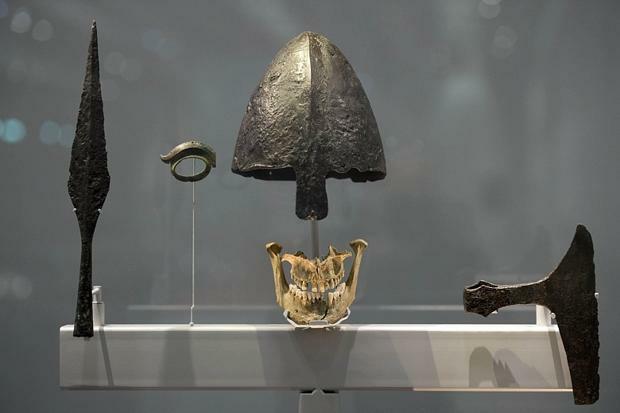 However, if you didn’t fork out for the British Museum’s £4.50 audio guide, you’d have walked past the swords without the slightest idea what they were. This Viking filed his teeth down to fangs. It’s always good to see the lives of women represented, especially when it’s not limited to the domestic. We loved the section on sorceresses. These women possessed the gift of prophecy and were feared and respected in equal measure, making their grave goods particularly fascinating. Although the spiritual practices of different Viking settlements varied, there was a widespread belief in shapeshifting. 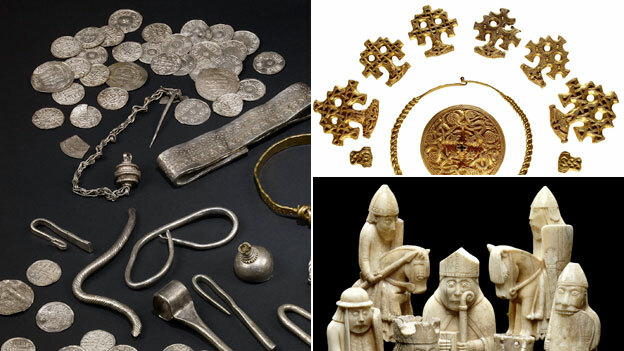 Men turned into bears and wolves, but women’s spirits were allied to more furtive creatures like birds and fish, offering an interesting window into the Viking gender divide. Near the sorceresses’ wands and finery, there was a tiny statue of a figure wearing female clothing, but labelled as ‘probably’ Odin nonetheless. This made us wonder if (much like female skeletons found buried with weaponry and consequently classified as male) we’re projecting our own gender theory onto history for want of further context. As the Vikings were a largely oral culture, we’ll probably never know. 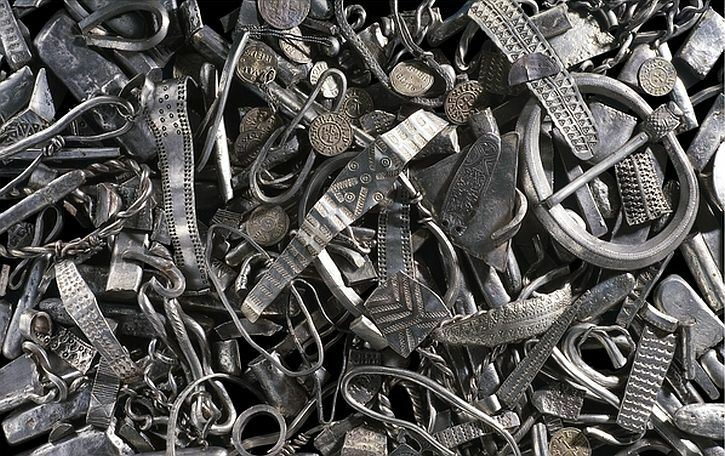 The Cuerdale Hoard, c 905-910. Speaking of skeletons, bones were displayed sparingly and to great effect. 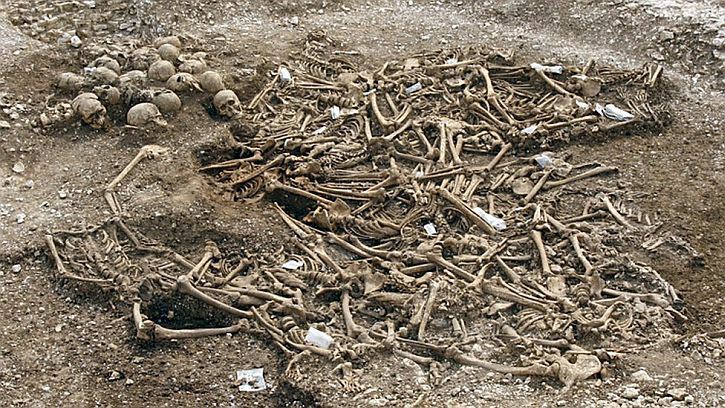 Turning a corner, visitors come across a pile of skeletons divested of their heads – an entire Viking ship’s crew, dumped in a mass grave in Weymouth. The bodies were laid out as they were found, sprawled, face-down, fingers missing, suggesting their hands weren’t tied before execution. We’ve all seen human remains in museums, but this was unusually visceral. All this was fascinating – if you got close enough. Our major criticism was echoed by everyone we know who’s been to the exhibition: the overcrowding. Many of the smallest and most delicate pieces were by the entrance, creating a bottleneck of bodies. At times it was impossible to see exhibits, and most of the labels were placed below the cases, meaning only the visitors with the sharpest elbows could read them. I’m 6’1″, and I struggled. By the time the room opened up to reveal the breathtakingly gigantic Roskilde 6 ship, most visitors were too stressed to enjoy it. I love The British Museum, but they should have known better than to cram people in like that. However, if you’re tall or determined, Vikings: Life and Legend is still on until the 22nd of June 2014.